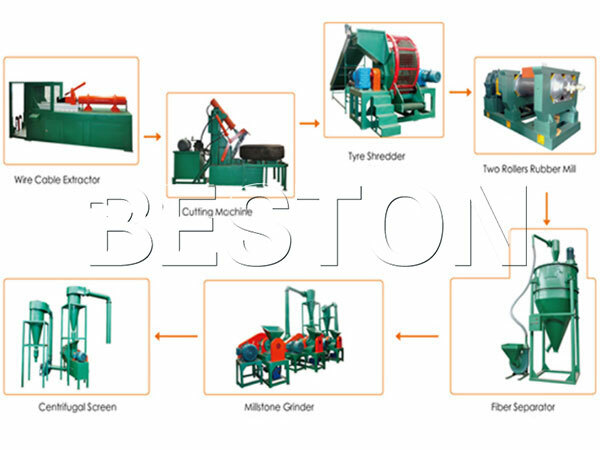 You may have realized the importance of recycling waste tyres, and you may also have the desire to know about details, so here we will give you a brief introduction to Beston waste tyre recycling plant for sale. Many people have realized that harm the waste tyre brings, such as disease, fires, and so on. So make those waste tyres recycled is a urgent thing. Our plant is designed basing on this situation. It turns waste tyres into fuel oil or rubber powder according to the different equipment you choose. But it is certain that no matter what method you use, the waste tyres can be energy, from which you can make your own profits. Among all those waste tyre recycling plants in the market, how to choose the right one is the most important issue you may concern. In my opinion, you should firstly make sure what you want to get from waste tyres. 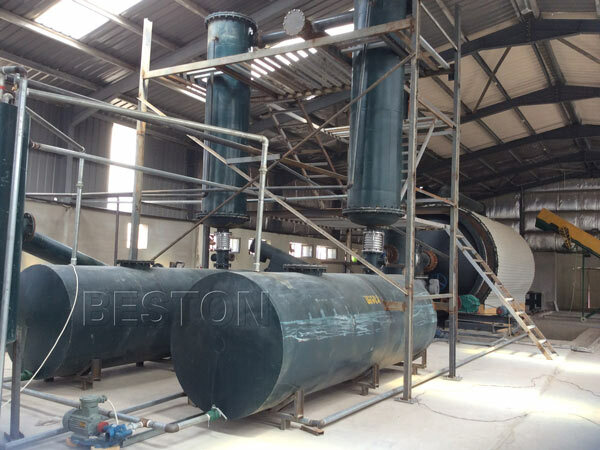 If you want to fuel oil, then the waste tyre pyrolysis plant is the best choice. And if the fine rubber powder is your ideal end product, then I will recommend you the fine rubber powder production line. As one of the most professional waste tyre recycling plant manufacturers, we can satisfy your demand no matter what kind of plant you want to purchase. First, turning waste tyres to oil machine. It mainly uses the waste pyrolysis technology to get the waste tire recycled. This plant processes the waste tires with high temperature within a oxygen-free condition. When the temperature reaches a certain degree, the oil gas will be released. The mainfold can separate the heavy oil gas and light oil gas. Then the condenser will help you get tyre fuel oil, and other devices of this plant can ensure that there is no pollution. Fuel oil is not the only end product, and you can also get steel wire, carbon black. 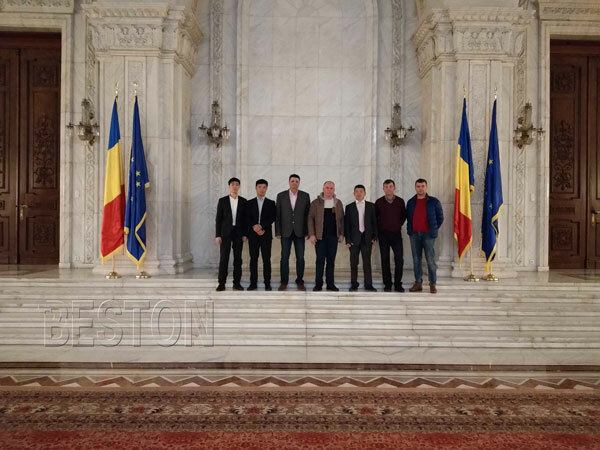 You can use them directly as fuel, or you can refine them with the carbon black processing plant, waste tyre oil distillation plant we provide. For our waste tyre pyrolysis machine for sale, you can choose the BLJ-6, BLJ-10 batch plant, BLJ-16 semi-continuous plant, or the BLL-20 fully continuous waste pyrolysis plant. They have some differences in operating ways and raw materials they can dispose. If you buy our plant, our sales manager will tell you the details. Firstly, the continuous pyrolysis plant needs pre-treatment devices. Before putting tires into its reactor, it needs a tire shredder to cut the tires into small pieces (30-50mm). While the batch pyrolysis plant doesn’t need pre-treatment devices and the tires can be put into the reactor directly. Secondly, for the continuous plant, the tires can be transported to the reactor by an auto feeder. Besides, its discharging of carbon black and steel wire are both automatic. While for the batch plant, the feeding process and the discharging of steel wire are both manual. Our waste tire pyrolysis equipment have been sold to Jordan, Brazil, Indonesia, and many other countries. 1.Safety. We equip each set of machine with mature safety devices , including alarm for over temperature and pressure, auto pressure releasing system, extra gas recycling system, fire fighting devices,which can guarantee 100% safety in the production process. 2.Energy saving. Extra gas recycling system can recycle the inconsenable gas to heat the reactor as fuel. Thus, the energy cost is fewer. 3.Environment protection. In the dedusting system, three steps (water spray, ceramic ring filter, washing chamber) are used to dedust the exhaust gas,and the released gas will be pollution-free and can be discharged into the air directly. 4. High oil yield rate. For the big car tyres, the rate is 45%. For small car tyres and bicycle tires, the ratio is 35%. All in all, the oil quantity and quality are pretty high. The other equipment we recommend for you is the fine rubber powder making machine. This machine consists of wire drawing machine, jaw cutter, coarse crusher, belt conveyor, screw conveyor, fine crusher, fiber separating machine, vibration and magnetic machine. From those name, you can basically know their function. You can draw the wire out of the tyres with the drawing machine. Then using the jaw cutter to get small size waste tyres. The coarse crusher can turn small size tyres into 50 mm rubber block, which can be reprocessed by the fine crusher. The fine rubber powder is widely used in building athletic ground, such as runway, school playground, bowling alley and so on. Through various waste tyre recycling plants for sale, you can get different energy from waste tyres. On one side, you can reduce the pollution caused by waste tires. On the other side, you find a new way to get more profits. So if you have the will to make an investment in this plant, you can find more information on the Internet. Or you can contact us directly basing on the following chart.